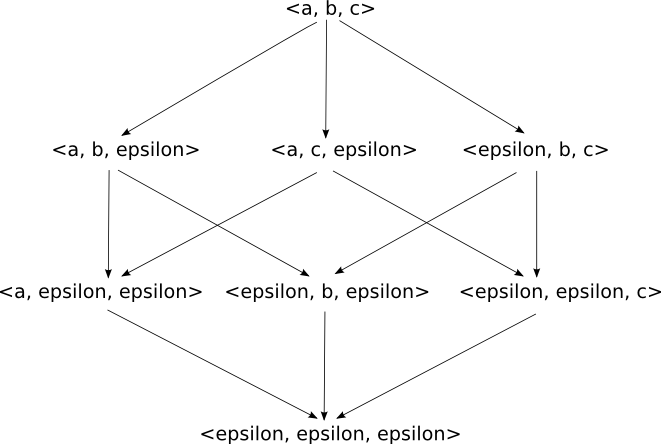 Nodes that do not appear in a synchronization vector are synchronized with the event ε (epsilon). This implicit synchronization can transform events of a node N as hidden events in the ancestor of the parent of N. To illustrate this phenomenon, consider a system with 3 levels of nodes as given below. The semantics of nodes A is straightforward (see the figure below). As explained in previous sections, the semantics of B represents the interleaving of the event a of sub-node a and the event b of B. On the figure below, epsilon events are displayed as empty labels. Actually transitions of B should be labelled by synchronization vectors of the node i.e. < ε, a.ε >, < ε, a.a > and < b, a.ε >. A subnode does not known events or variables existing in its parent node. This rule is guaranteed by the order of declaration of nodes. A compound node can constrain only flow variables and events of its declared subnodes. A compound node can change the initial values of all state variables at any depth in its hierarchy. private means that the object is visible only by the node that has declared it. parent means that the object is also visible by the parent node. public means that the object is visible by all ancestors. Using these attributes, default visibility rules can be summarized as follows: state variables are assigned the private attribute (except for initialization), events and flow variables are assigned parent. 14                        // is not an event of the interface of b2. AltaRica language permits to specify priorities between events. In a given configuration, if two events are possible then only the one having the highest priority can actually occur. Priorities are locally defined in a node by a partial order on events. If two events are incomparable w.r.t the specification then they are both possible. The declaration of events and the specification of the partial order can be mixed; for the sake of clarity, one should prefer to define the order after the declaration of events. synchronization vector based on events of the hierarchical node. Compound nodes can be viewed as controllers that constrain their subnodes using: assertions, synchronizations and priorities. Synchronization vectors defined (implicitly or explicitly) in a node are allowed combination of events. A combination can occur in the system if all components of the vector are possible; thus, if just one of the component is inhibited for some reason the vector can not happen. Using this synchronization mechanism, the modelling of a broadcast phenomenon or a common failure mode becomes tricky and not natural because if some events are missing the synchronized event can not occur. For this reason, the AltaRica language permits to write weak synchronization vectors (usual vectors are called strong). Syntactically it just consists in adding question-marks (?) to events. a marked event that does not participate to the synchronization is replaced by ε. Given this set of vectors and the partial order on this set the standard semantics with priorities is applied. Note that the order on vectors is applied prior to the order on local events of the compound nodes. The language proposes additional notations to manipulate the lattice. Constraints on the number of marked events can be specified (> n, < n, >= n, <= n, = n) to enforce a given cardinality of possible marked events. For instance if >= 1 means that at least one marked event has to participate to the synchronization. min and max keywords specified at the end of the vector indicates that the synchronization has to use a minimal or a maximal number of marked events (by default max is used). Abstract types, constants and signatures can be used in any AltaRica expression. Up to now only ARC supports this extension and this support is limited to the flat semantics of nodes.